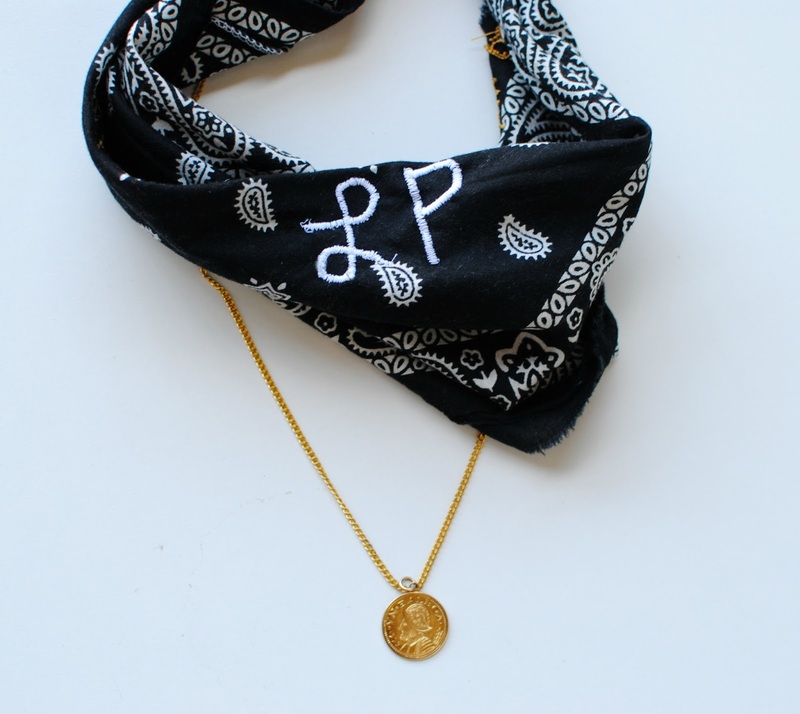 Making a comeback this summer as a neckpiece or headband, the bandana isn't just for baby drool or cowboys anymore. Another trend I'm a fan of is the custom embroidery detailing on denim, tshirts, etc. Mixing the two in this simple tutorial and all you need is a basic sewing machine. 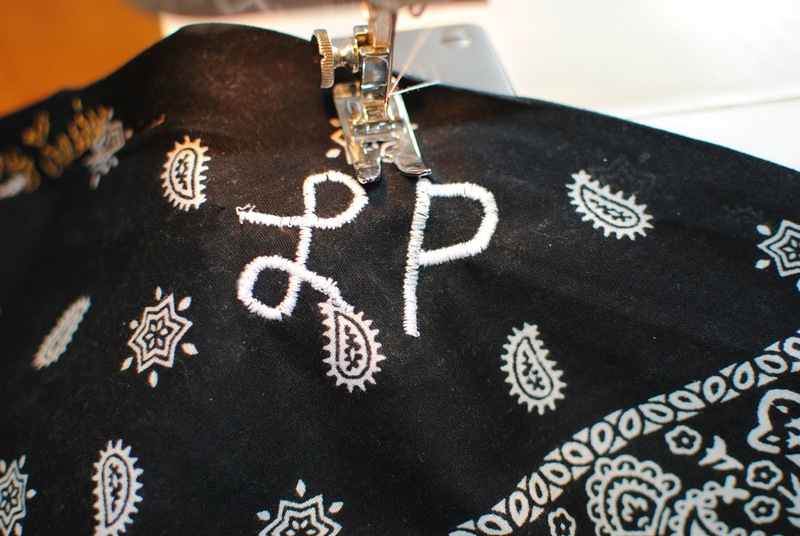 Their are two ways to monogram/embroider on fabric without an embroidery machine or by hand. 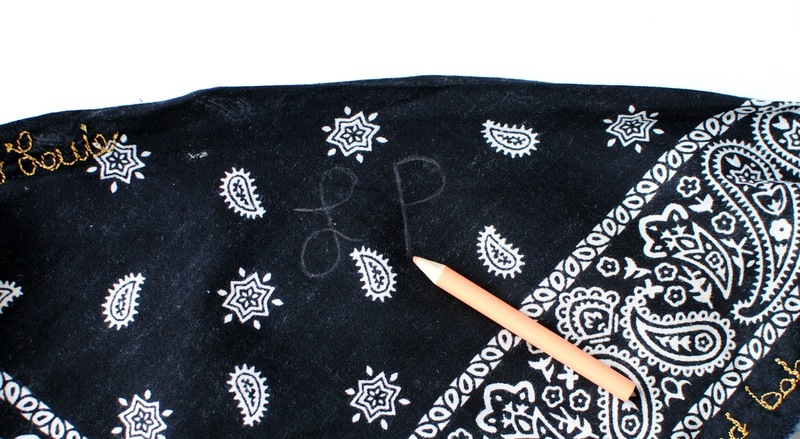 I customized a bandana but you can do anything. I'd like to do a collar next with my initials on each side or even some denim or tshirts. Begin by writing out your letters with a light colored pencil. I folded mine in half so it would be in the middle. I also went through both sides because it gave it some extra thickness. You will then put your stitch length to 0 and width to however wide you want it. If you are starting say a cursive L, you will want the width to start smaller and get wider as you go and when finishing get smaller in width again. Follow your traced lines and take your time. On the curves to pivot just lift the presser foot and maneuver it around the curve little by little. You can repeat to get a more solid line. Another way to do this is with a free motion foot. You can trace out the words or just wing it like I did. This can be tricky so practice on scrap fabric. I'd also suggest a thicker fabric like cotton unless you have interfacing it can jam up your machine. Different effects but both have a nice finish depending on what you're going for. Looove the outcome! Looks great! People can plan some activities for Sunday and http://college-paper-writing-service.reviews/ wishing them good luck. People need to choose better things in their life. They need to improve their choice to select right things in life which can be suitable for them.